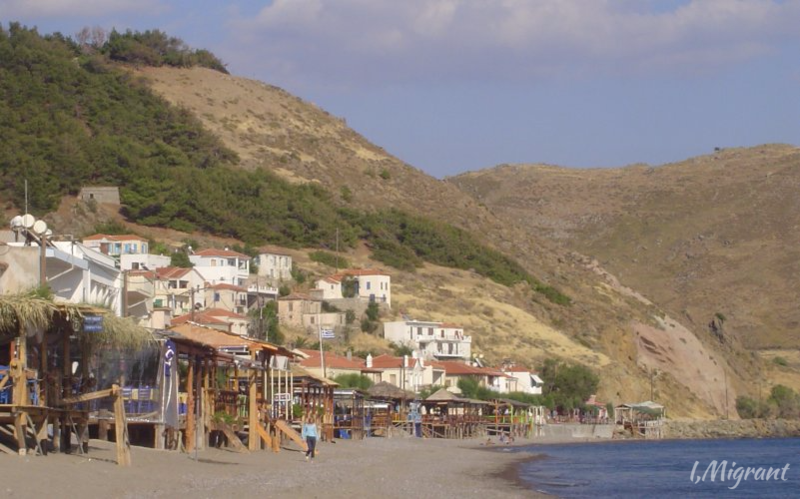 Time seemed a different creature on Skala Eresou, a small coastal village on the western side of Lesvos. Days flowed one into the other unhurriedly, creating a boundless ocean of eternal possibilities. Waves crashed soothingly onto the stony beach as night gently laid a thin, silk, black veil over the island. A respectful quiet permeated the air. My timepiece said it was 10 minutes to 10, but the moon shone brighter than I’d ever seen, tranforming the sky to a translucent cobalt blue. On the soft, swelling, sultry sea — liquid pellets of pearls, crystals, and diamonds tap-danced gracefully, flitting with delicate certainty on ebony glass. It was a brilliant portrait of infinity. It was almost visible just over the ocean’s edge. Looking out at the wide, open Aegean, infinity was no longer frightening. I sat in a café along the boardwalk staring at the Rock that is the one fixed point on the waters before me, wondering how I ended up here. In this remote “spiritual-island-town-with-a-dramatic-coastline” that travel guides also call “charmingly counter-cultural”. 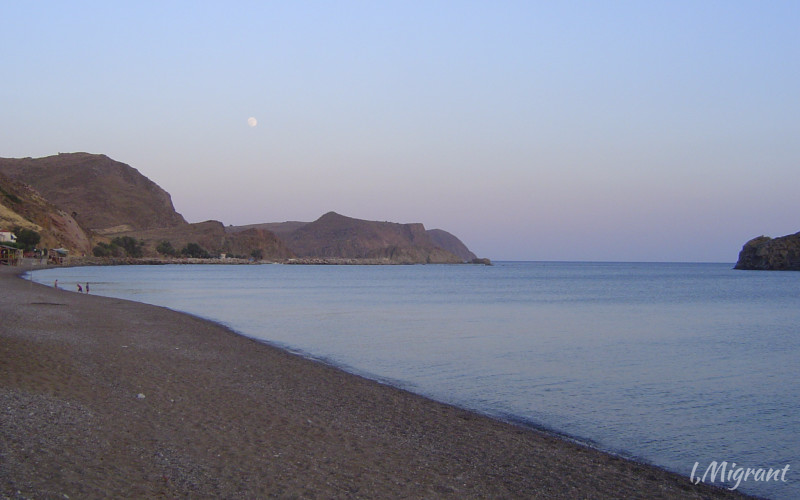 The Rock in the Aegean sea as seen from the beach at Skala Eresou, Lesvos. 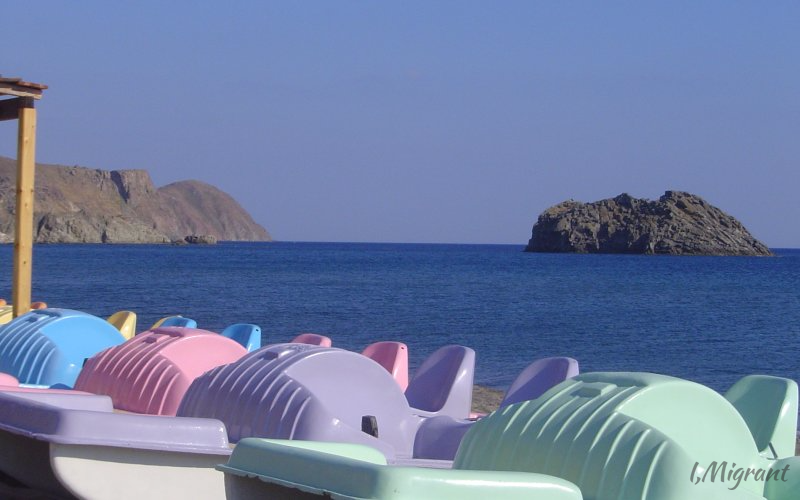 Skala Eresou is full of former hippies, artists searching for inspiration, and yoga practitioners living side by side with hearty fisherfolk and robust housewives. Everyone from everywhere who liked “off-the-beaten-track”, budget-friendly holidays came to visit: young families, tired city folk, followers of spiritual gurus, honeymooning couples, and women looking to take in the birthplace of the iconic poetess Sappho. 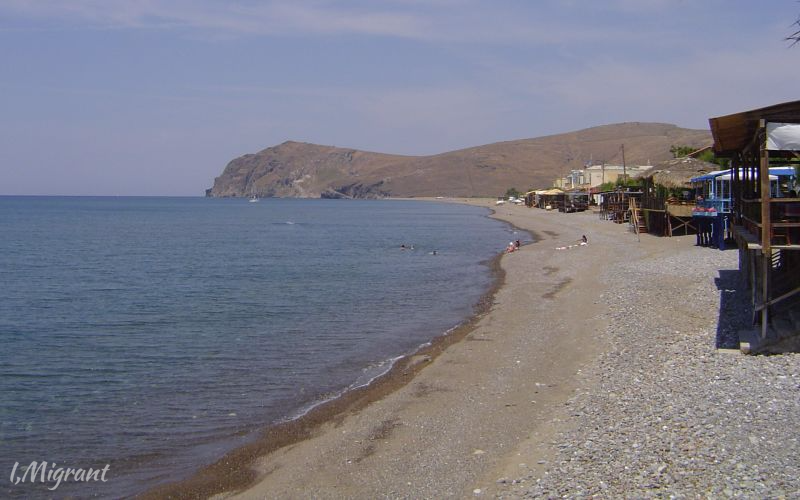 The stony Skala Eresou beach on Lesvos. A friend once called it “the ugliest beach in Greece”, but that didn’t matter. It was the essence of the place that enchanted. The palpable spark of inner beauty, the warm camaraderie that engendered; the laid-back fellow tourists, and most importantly – the engaging, welcoming villagers. At day’s end, the taverna owner takes down the octopus she’d hung out to dry. It would then be grilled and offered to patrons with olive oil and slices of lemon. It was a village that could strip you bare and leave you feeling free and re-born. Grateful for the simplest of life’s gifts, without need for fixed points. On the other side of the island, at a different time, people are awakened by the primal crying. The sound is obscene. There’s no escaping the horrific pain in the shrill voices that cut the otherwise pristine night. There haven’t been quiet nights on Lesvos in at least two years. More than a million people fleeing from war have come across the harsh Aegean seeking better lives in Europe. Thousands of them landing on the craggy, uneven shores at all hours of the day. Packed like sardines on precarious inflatable boats. Risking everything on rubber and pressurised gas. Along the coast, villagers rallied to help the new arrivals as much as they could. Warm blankets, dry clothes, food, and drinking water. Sometimes, a handshake would be difference enough. Often, there was no other way to communicate. The people from across the sea spoke a variety of different languages. None of them Greek. One Syrian boy – he looked no older than 12 – could only repeat “thank you, thank you, thank you” in accented English through his unending tears. It was impossible not to have your heart broken. But that was two years ago. The villagers, long tolerant and helpful, are no longer feeling as welcoming. More people than the island’s own population have come in, and the community is not equipped to handle it. Most of the refugees have gone on to the mainland or been repatriated, but more than 8,000 of them are still on Lesvos. Kept here by a change in rules and the long delay in “processing” their onward passage. Over 6,000 living in conditions that have been likened to an open-air concentration camp. The rest are scattered about, being cared for by volunteers who have set up their own help stations. 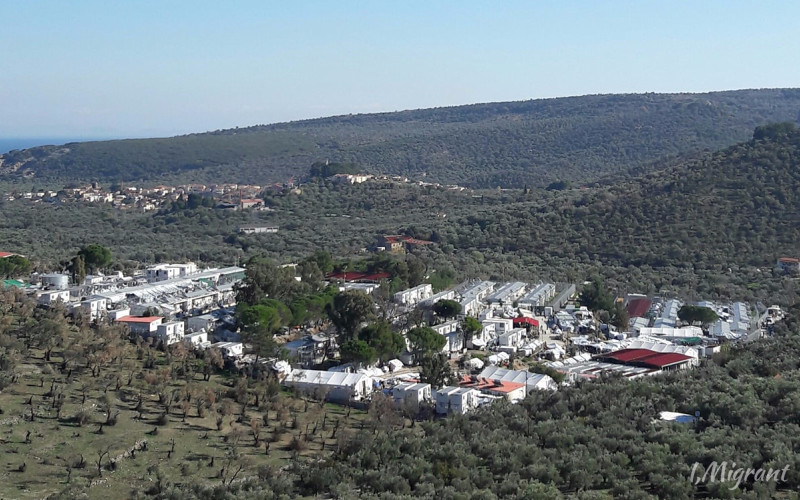 The over-crowded Moria camp was built to house 2,500 refugees. There are nearly 7,000 people crammed into it, in conditions described as “barely livable”. Many of them have been here for months waiting to be “processed” and hoping to move onto the European mailand. EU borders have been closed, but people are still making the perilous journey across the sea from Turkey. There is anger now on all sides. 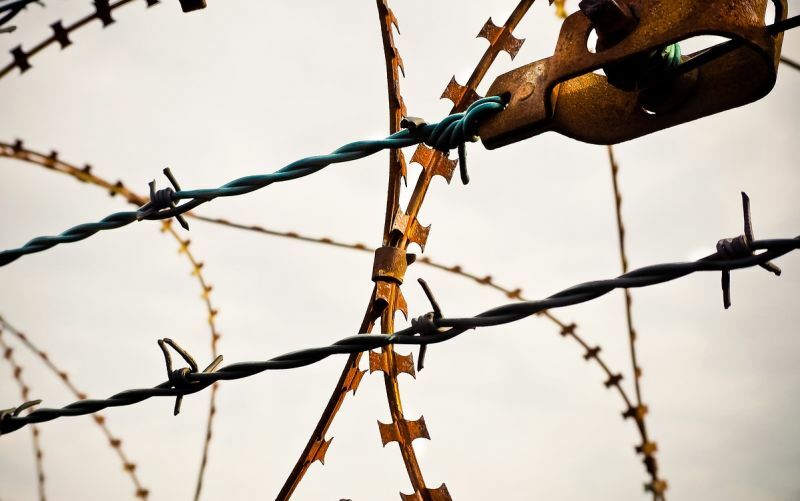 Locals are afraid the national government wants to transform Lesvos into a “prison island”. And frustrated , disheartened refugees are fighting amongst themselves and rabble-rousing. Some have been accused of stealing from locals and attacking their animals. The situation has deteriorated so much that some people say the animals are treated better. According to relief workers, many of the refugees now also suffer from mental health issues. Anxiety. Depression. Post-traumatic stress. A number have harmed themselves, or committed suicide. This is not what they fled their wartorn countries for. “We just want some place safe – that is most important,” one man called out. Some place safe. Here, there is no fresh seafood, nor grilled octopus. No crisp vegetables, nor delicate meals. Instead, they get rotten smelling meatballs and soggy rice. And that’s on a good day in the UN camp. On top of it all, Greek authorities have started arbitrartily detaining refugees and holding those whose initial appeals have been denied, prompting a few of them to go on hunger strike in protest. Arash Hampay’s brother was detained in April and not released until August. Last winter, Hampay said, he saw people die from cold and hunger while authorities did nothing. Another winter is now upon them. The Greek government has plans to rent entire hotels and bring two ships over to house the continuing stream of refugees. A plan highly unpopular with the locals. No matter how hard it is, Fardin Joinda is determined to stay focused. He came from Afghanistan, travelling through Iran, then illegally onto Turkey to make his way to Greece. “I lost my home, my family — I didn’t come here to eat and sleep.” Joinda learned to speak English at one of the camps, and went on to work as a translator for aid organisations. He’s also put together videos about the refugee experience. Joinda refuses to lose hope. So seemingly obvious, but it’s proven difficult for some people to understand. 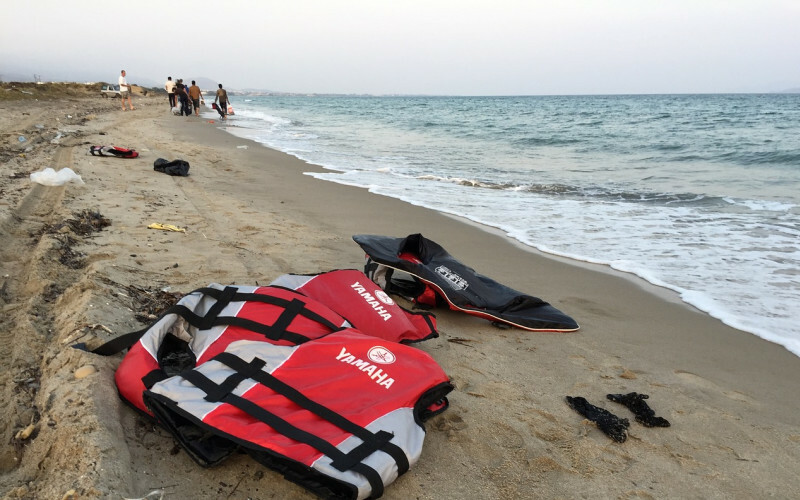 Before the arrival of the refugees, less than 90,000 people lived on Lesvos. A great portion of the island’s income came from tourism. There were fears that tourists would stop coming, but islanders have made do, catering to aid workers and humanitarian agencies. The islanders were also nominated for the Nobel Peace Prize in 2016 for helping thousands of refugees. This is not the first time Lesvos has seen a wave of people seeking refuge. In the 1920s, over a million Christian Ottoman Greeks were expelled from Turkey. In exhange, nearly half a million Muslims were sent in the opposite direction. Ebb and flow, like the rolling womanly waves of the Aegean. A long-expereinced seductress dancing sensuously under the heavy caress of the Hellenic night. Moonlit jewels, and the fearful call of infinity. The air undulates with the crass inhumanity of man towards his brother. Across the sea, boats like tear drops keep tracking broken dreams towards the coast. Each shipwrecked soul utterly terrified of being cast on the treacherous shores of hope.